The real-life stories behind twenty-five favorite songs of the death and resurrection of Christ. Includes complete musical score, Scripture readings, and devotional thoughts for meditation and prayer. CD and cassette include renditions of each song in the book. - Publisher An uplifting collection of 25 favorite hymns focused on the theme of Easter. 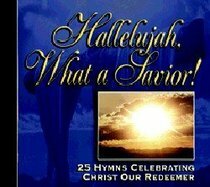 About "Hallelujah, What a Savior"
An uplifting collection of 25 favorite hymns focused on the theme of Easter. Kenneth W. Osbeck (LittD, Cornerstone University; MA, University of Michigan) taught for thirty-five years at Grand Rapids Baptist School of the Bible and Music and at Grand Rapids Baptist College. He also served as music director for Children's Bible Hour, Radio Bible Class, and several churches. He is the author of several books, including the best-selling "Amazing Grace: 366 Inspiring Hymn Stories for Daily Devotions"; "101 Hymn Stories"; "Hallelujah", "What a Savior! "; "25 Most Treasured Gospel Hymn Stories"; and "Joy to the World."